The holidays are (mostly) over and now it's time to catch my breath. It was such a fun year and everyone seemed to like their handmade gifts :) I barely finished in time. I was working on sewn projects almost right up until we left for Mario's parents' house and then I finished crocheted projects on the drive and on quiet mornings while everyone was digesting *delicious* breakfasts. I ate SO MUCH between Saturday and Tuesday, it is amazing I didn't explode or something. But everything was delicious! How could I resist tamales and beans and cinnamon rolls and cookies and pot roast and and and... YUM. Anyway, here are a few of pictures of the things I finished between the last post and this. Polka dots on the inside. Skipped the pocket for time reasons. Finished holiday quilt. Sorry for the photo- I had no one to help me! I also made a pretty hat for my grandma, but I didn't get any photos of it before I gave it to her. Oops! You'll just have to trust me on the prettiness. 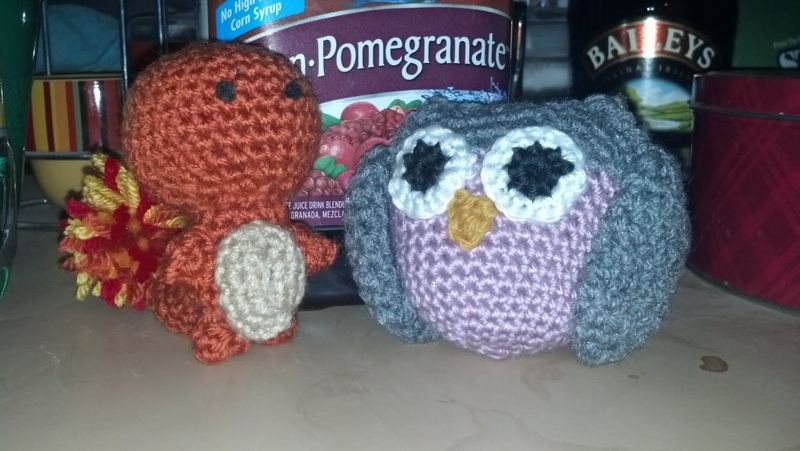 I'm planning to make another Charmander and a Squirtle and Bulbasaur as another gift for a nerdy friend of mine. I will see him for New Year's so I guess I have the weekend to finish. Yeah. We'll see if that happens. I already have all the pieces done for Charmander, though, so he'll at least get that! I'm sort of relieved and sad that the holidays are over. This is my favorite time of year. There are so many things to celebrate... my anniversary, Thanksgiving, my birthday, Christmas, New Year's. All in a little over a month and it's over! Every year I feel it is too soon. But at the same time, things have been so hectic and crazy, it is kind of nice to be able to sit and enjoy my coffee in the morning without worrying about all the things I have to do that day. But the new year will bring happy, exciting things! I interviewed for a job before Christmas and am now waiting for a background check to go through before my second interview. Cross your fingers for me! But if that one falls through, I should be getting another interview after the holidays. And I have applications pending at several other places. So I better enjoy my brief break from working full time while I can! I like the blue quilt you did! Boy, you were busy! So many neat things. Glad you had a good celebration month!